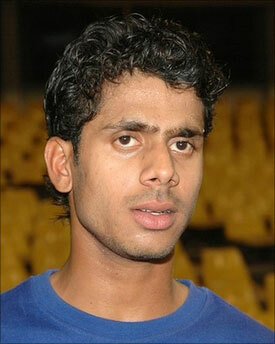 Manoj Tiwary symbolises Bengal's new brand of cricket, one built on youth and fearlessness. Within two years of first-class cricket, he has become the most talked-about name outside the Indian team, a refreshing fact in this day and age when it's largely international players and Under-19 stars who get most of the attention. Tiwary has a minimalistic approach towards batting; bowlers are meant to be hit, and the purpose of batting anywhere is to make runs. He goes about doing that in the most aggressive of manners. He has idolised Kevin Pietersen, evident through his mannerism on the field, and favours the front foot more. After being shunted up and down in his first full season in 2005-06, he got a more certain No. 4 position in the next season and made it his own. He scored three scores of 150-plus and his average of 99.50 took his overall first-class average to 57.50. 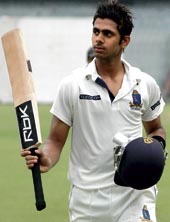 At 21, he has already led Bengal to a Cooch Behar Trophy triumph, and was also asked to captain the state in the Twenty20 championships, despite the presence of Deep Dasgupta and Sourav Ganguly. An aggressive and passionate Bengal cricketing fraternity has already nicknamed him chota dada (in reference to Ganguly's nickname, dada) and, on the back of India's World Cup debacle, was fast-tracked into the one-day side for the tour to Bangladesh in 2007. He made his one-day debut in Australia in February 2008. 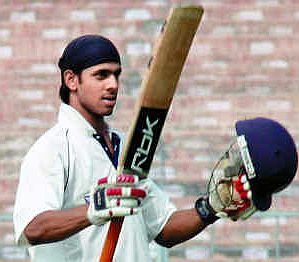 Ahmedabad, April 20: Bengal all-rounder Manoj Tiwary’s call-up for national duty was expected, after the way he was instrumental in taking Bengal to the Ranji Trophy final. The writing was there on the wall. This is such great news. My hard work has paid off. Now I will have to work harder and play well for my country,” said the right-handed batsman and leg-break bowler when contacted by The Indian Express. “I have the confidence to perform at the highest level. I play according to the requirement of the team. My job is to perform. It makes a difference when some great cricketer praises you (talking about Greg Chappell’s comments). There is an added responsibility to do well. But when I am on the field, I only think of my game, everything else blurs out of my vision. So was he expecting the call? “Yes, definitely. After such a lovely domestic performance I was expecting it. I got the news from the media at the hotel lobby,” said Tiwary, who is still in Ahmedabad after finishing his Twenty20 assignment for Bengal yesterday. The speculation in the media about his possible call to Team India had added to Tiwary’s excitement. “Yes, I was reading about it and was waiting for it. But I didn’t allow any tension to creep in. Last night I had dinner and quietly went off to sleep. But this morning I couldn’t control my emotions. They spilled out,” said Tiwary. He credits his coach Manobendra Ghosh for shaping him into the cricketer that he is. Whenever there is any problem, Tiwary seeks his help. “I keep talking to him every now and then. He sorts out all my weaknesses. 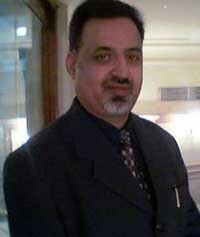 Last year I was facing a problem so I took a CD of my games to Manobendra Sir. He pointed out the flaw. My stance was open which was giving me trouble to play outgoing deliveries. We both worked on it for about three and half hours daily for a week and sorted it out,” said Tiwary.